​After last week's episode "The Death of Facebook Ad Managers", I mentioned the amount of money I spend on Facebook Ads and got some messages from people wanting to know if they can make it work with much less money spent. With this podcast, in particular, we have a very diverse listener base. Between Drop Ship Lifestyle that help people start out, build and grow their store to the Inner Circle, which is mostly people with over seven-figures in sales, this podcast seems to hit everyone. A good realistic starter budget is about $33 a day. Over a month, that's about $1,000 in ads. This is what it is going to take to get meaningful results (Sales!!). You should be getting a 10x return on ad-spend. So $1,000 in ads should be $10,000 in sales. Monitor your ads. If you don't see sales in two to three days. See what might be the problem and change. Over 100 Drop Ship Lifestyle members go to our yearly retreat. This year it's in Prague. Message me at [email protected] and I'll send you all the details. Good morning, everybody. 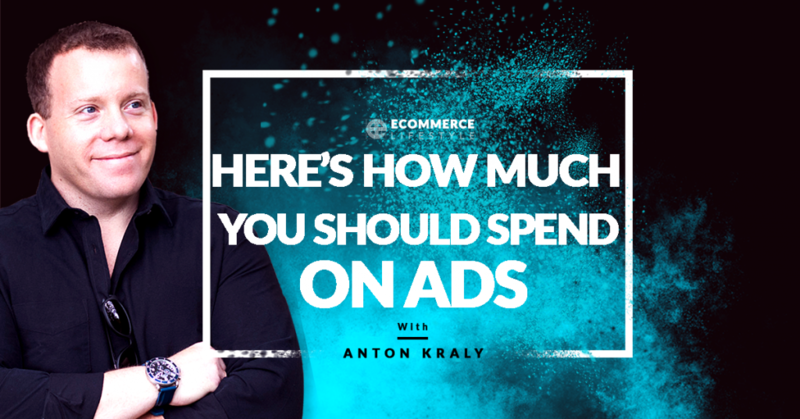 Anton Kraly here and welcome to another episode of the eCommerce Lifestyle Podcast. It's funny, I just realized that every recent episode probably starts with the sound of the blinker of my car, because typically on the way to my office, it's one block away from my house, I stop at a coffee shop, get a coffee, and then as I'm turning out of the parking lot is when I turn this thing on. Probably sounds like ... That's my theme song, my blinker in my car. That's our official [inaudible] for the show. But, I wanted to record a quick episode on my way in today because yesterday I published an episode called The Death of Facebook Ad Account Managers. If you haven't listened to that yet, go back, check it out. Definitely lots of valuable information shared there. But, one of the things that I kind of just mentioned in passing, as I was doing that episode, was how much we're spending month-to-month and most likely this month in our Facebook ad accounts. This month, it's going to be close to 200K and typically an average month is probably 150. Really hasn't dipped below 100,000 in a month in a long, long time. Some months it gets up to as high as 300K and that's not including Google, that's not including influencers, that's not including what we invest into content or to anything else. What happened after I posted that episode is I got a couple messages from people saying, "That's a lot of money. I'm just starting out. Can I even make this work?" The answer is, yes, you definitely can. What I just want to explain first is ... I'll talk about realistic budgets and how much you need to start, because the amount of money we spend now, I mean, multiple new hyper cars every month in ad spend is nothing I would've ever, ever, ever imagined myself doing when I was starting out. Honestly, it would be the dumbest thing in the world to do so, even if you had somehow the cash laying around. We'll talk about realistic budgets, but I do want to mention one thing before I do that. That is that with this podcast, eCommerce Lifestyle. We definitely have a ... What's the right way to say it? A diverse, I guess, diverse audience base, a diverse group of people listening and that's for a couple reasons. One of them is because I am best known in the online marketing space for drop shipping, for Drop Ship Lifestyle. If you don't know Drop Ship Lifestyle, go to dropshiplifestyle.com. We were voted the best eCommerce course by Shopify, have hands down the best eCommerce courses, and communities online by far, and if you're not part of that yet, go to dropshiplifestyle.com, click on enroll, and just stop wasting time, and go get enrolled. But, I also have an other group of, I guess, I don't know what the right way to say it is, maybe people that I speak to. These are people that are running eCommerce stores, people that are doing high seven, eight figures in sales. They're the type of people that my eCommerce Lifestyle inner circle is becoming a thing because of. And for that audience of people, when I mention the type of numbers we spend, they feel a lot more comfortable with it. But either way, I do want both of these, I guess, different, again, groups of people to benefit from these podcasts and I do want to be able to speak to everybody. While the last one was more about kind of high level spending, even though it applies to smaller budgets, what I want to talk about today is what is realistic? If you're listening to this, as someone who's just starting out and thinking, "Anton, my house is worth $300,000. How am I going to spend that in two months in ads?" Listen, you're not. That's the simple answer. I think a good realistic starting budget for any type of eCommerce store is about $33 a day. Now, why $33 a day? Because when you extrapolate that out over a month on average, that means you're investing about $1,000 a month into ads. Now, even if you're thinking, "That's a lot of money. If I spend $1,000 and I just lose it, that's a big portion of money. I don't want to lose 1,000 bucks a month." Yeah, I get it. That's not the plan, right? The reason I recommend you spend about that much is because that's what it's going to take in order for you to get any meaningful results. When I say meaningful results, I mean sales, I mean profits. Now, as a general rule of thumb for a new store, again, this is assuming you have a good looking store with good products that's optimized to convert. This is assuming you followed one of my trainings, like the Drop Ship Blueprint from Drop Ship Lifestyle. Then a good rule of thumb when you're first starting out is that you should be striving for a 10X return on ad spend for paid traffic. What does that mean? That means if you spend 1,000, the 10X return on ad spend would mean that should bring in $10,000 in sales. $10,000 in sales, assuming a 30% net margin, maybe you're making about ... Call it $3,000 a month net profit. Maybe on the low end, 2,000 bucks net profit. But again, in order for you to make that money, you spend that 1,000. I'm already subtracting that from the net profit, by the way, so that doesn't come off of net. That's already taken out from gross. That's why I recommend you start with about $1,000 a month, because you don't want to start with $20 a month and then hope you get one sale, because it's going to take so, so long for you to get enough visitors, enough data, enough conversions to make any meaningful amount of money. 1,000 bucks, if you don't have that now for ads, go on Craigslist, go on Facebook Marketplace, whatever, sell some stuff if you have to. But when you're serious about this and when you want to turn this into an actual profitable business that can create a new lifestyle for you by getting you more freedom from new income, again, expect to invest into ads. Now, as things scale, as you spend more and more, that 10X return on ad spend, it'll fluctuate. Typically, again, as a general rule of thumb, as you scale, return on ad spend does go down. But when you're dealing with relatively low budgets, again, call it a $1,000 a month, more than possible and honestly you could beat that. But that should be a good starting point. Now, taking it from there, how much should you spend on ads month two, month three, month four? How much should you spend on ads a year from now? Well, here's the thing. I can't answer that question for you right now because I don't know how much money you're going to get as far as return on ad spend, I don't know how you're going to operate your business, I don't know what your conversion rate's going to be. But assuming if you spend $1,000 in a month on ads, again, you do it the way I teach you and it gets you about $10,000 in sales, you make yourself two to 3,000 net, then guess what? Next month I would say, "Hey, bump that up. Try to spend $2,000 this month. See if you can get to $20,000 in sales." Again, double your revenue, double your net profit. Did that work? Okay, cool. Maybe next month spend 3,000 or spend 4,000. But here's the key, okay. With this model, with eCommerce, and specifically with the way that we get traffic and the way that I teach you, we are not doing it hoping that sales will come in in a week, in two weeks or a month from now. We're not just laying out money and giving it to Facebook and to Google for Google Ads and hoping like, "Well, maybe these people will buy from me in a few months. We'll see what happens." No, no, no. If this is going to work for you, if you do this right, you'll be getting sales within two to three days. That's kind of ... It's not the right way to phrase it, but that's kind of what I call the payback time, where you're putting out there, with money ... You're putting money out there for your ads and if you're not getting paid back in the forms of people buying from you within two to three days from those ads, then something's wrong and then that problem can be addressed, could be fixed. Yeah, you could take it from there. But, again, just starting out, between Bing ads, between Google ads, between Facebook ads, I'd recommend starting with those three. Maybe not Bing. You could, but definitely Google ads and Facebook ads. 33 bucks a day, call it that. 1,000 bucks a month. Very, very realistic. Guess what? Like I just mentioned, if you do this right, that should be able to net you two or three grand net profit in your bank made every month. You spend a dollar, you get 10 in sales, you get to keep two or three as net profit. Not a bad investment at all. Again, once it works, once you have your data, once you have your numbers, you scale it. Guess what? Maybe a year from now might be a little jumping the gun, but maybe two years from now, maybe three years from now, maybe even five years from now, you're spending 100 grand, 200 grand, 300 grand a month. Again, it's not because you're taking out loans or getting investors, it's because you're profitable and it's because that 100 grand you're spending a month is getting you seven figures in sales every month and you're making a couple hundred net, right? That's the long game, guys. That's how it works. Don't get intimidated for everybody just starting out. You don't need much money to get started. Again, the goal is to get paid back right away. Hope that clarified some things for all [inaudible] people that might've been a little scared off. I'm at the office now. I'm going to head in. A couple side notes before I sign off here. For everybody listening to this that is a member of Drop Ship Lifestyle, yesterday I published the retreat page and we already sold a bunch of tickets, so if you want to go to our annual event, this is our sixth annual retreat. It's going to be in Prague. It is early in September. It's going to be absolutely amazing, over 100 Drop Ship Lifestyle attendees. I'm going to teach ... I already know what I'm going to teach and yeah, it's going to be eye-opening. Go get your ticket. I'm not going to share the link here because it is for members only. If you want to come, email Anton, A-N-T-O-N @dropshiplifestyle.com and I'll get you the link to get your tickets. If you're listening to this yet and you want to go to the retreat, or you just want to learn how I do this stuff, go to dropshiplifestyle.com, click on courses, choose the one you want, get enrolled and start building your own store today. That's it, guys. I'm going to head in, get to work, and I'll talk to you all in the next episode of the eCommerce Lifestyle Podcast. See you, everybody.